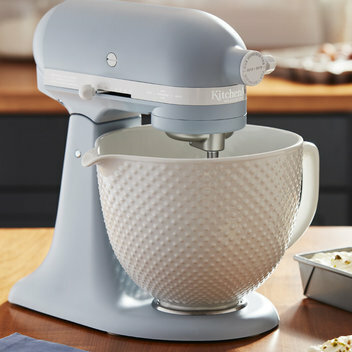 Add a new Misty Blue Mixer from KitchenAid to your kitchen | FreebieFinder UK | Freebies, Samples, & Other Free Stuff. To celebrate one hundred years of the legendary KitchenAid Stand Mixer, House Beautiful are offering one lucky reader an opportunity to win a Misty Blue version of the iconic mixer worth £699. This stand mixer has a retro trim band, unique hobnail Titanium reinforced ceramic bowl - which is chip, crack, crazing and stain resistant and also microwave, oven (up to 250°C), freezer and dishwasher-safe - and a custom powered hub cover to mark the Centenary. The mixer comes with standard accessories including a flex edge beater, flat beater, dough hook and wire whip. This was posted 1 week ago 12th April 2019 and expired 1 week ago 17th April 2019. Log in or register to House Beautiful to take part in this competition.